in a word 'non-standard' (OK two words). all may be needed to make the door both secure and easy to use. 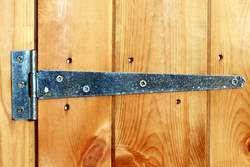 - Strap hinges The basic shed door hinge is the T or strap hinge. I say basic because although the hinge allows the door to open, the screw heads are easily accessible on the outside! If anyone is determined to get in they can just take the screws out and lift the door off. Security can be improved by using clutch head or star drive screws. - Security hinges An improvement on the basic strap hinge is the security hinge. This has larger holes to accommodate dome headed bolts. 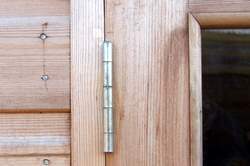 The bolts fasten through the door ledger on one side and into the door frame on the other. 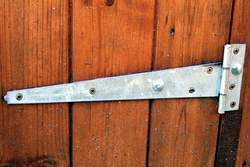 This is the most secure way to secure the hinges of an unframed door. - Concealed hinges The next step up in security is to use a fully framed door. By using concealed hinges the problem of being able to undo the screws or bolts is overcome.